When inexperienced call girl Alabama Whitman (Patricia Arquette) is paid to seduce comic-book-nerd and Elvis fanatic Clarence Worley (Christian Slater), she doesn't xpect to fall for him. But these two lost souls seem to be made for each other and quickly pledge their love, marrying at Detroit's city hall. Clarence discovers some newfound bravado and attempts to retrieve Alabama's possessions from her pimp, Drexl (Gary Oldman), who isn't exactly eager to let Alabama go. Fleeing Drexl's apartment, Clarence not only leaves a trail of bodies, but also inadvertently mistakes a suitcase of uncut cocaine for one with his wifes clothng and the chase is on. The unlikely newlyweds head for Los Angeles hoping to sell the cocaine and make enough money to leave the country. Unfortunately, they also have to contend with the mob, yuppie drug dealers and the police. Michael Rapaport is amusing as Clarences best friend who lives with Floyd, a stoner played by Brad Pitt. A sedate Dennis Hopper appears as Clarences father, who ultimately faces off with mob boss Vincenzo Coccotti (Christopher Walken). 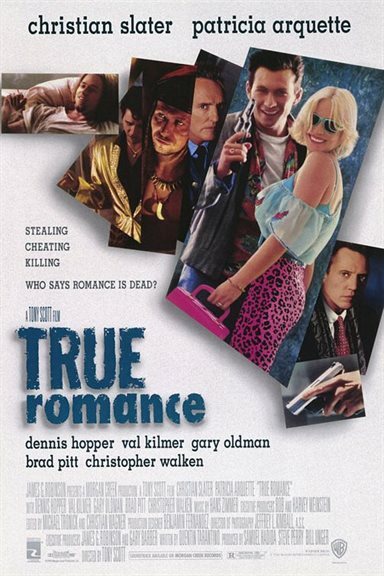 Download True Romance in Digital HD from the iTunes store. True Romance images are © Warner Bros.. All Rights Reserved.